Minerva Health Group (MHG) is a newly formed federation of five BANES surgeries. All our member practices are dedicated to providing excellent quality and continuity of care to our patients, along with strong focus on safe prescribing within the BCAP formulary. We are a not for profit organisation, established with Companies House as a company limited by shares. Our shareholders are the partners in each of the member practices. MHG have been working together collaboratively for the past 3 years. We have now formalised our joint working into a federation. The federation provides us with the mechanism to continue aligning our work environments, clinical and administrative processes and functions as well as combining best practice. As a federation, we are developing a multi professional Primary Care Team, with the aim of achieving a more sustainable workload alongside increased resilience in the current climate of increasing demand. The federation unites us as a total patient population group of just under 34,000 patients. Collectively, our federation is bringing together the best practice from each of member surgery to ensure the highest possible level of cohesive care to our practice populations. Dr Robinson has been a Medical Director of MHG since its formation 2018. 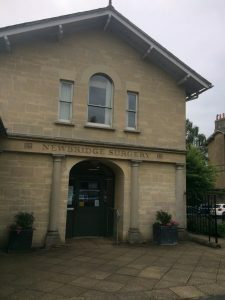 He is a partner at Combe Down Surgery and has been working in Bath since 2003. He is proactive in trying to support local practices improve the care they provide for their patients by sharing good practice across the federation. Working with local practices to build resilience and ensure a bright future for the staff and patients of Minerva Health Group. Lucy has been a Director of MHG since its formation in 2018. Lucy is practice manager at Rush Hill Surgery, and has worked in practice management for 17 years, having previously worked in finance and higher education following a degree in Business Management. Lucy has been extensively involved with joint and collaborative working between the MHG member practices prior to the formation of the federation and has a particular interest is making best use of information technology to improve resilience for our practice teams. Charles has spent 13 years as a practice manager having worked at 2 surgeries in the BaNES CCG area. He joined MHG as Director just prior to it’s launch having been closely involved in its formation whilst Practice Manager at Combe Down Surgery. With a background in education and IT, Charles is interested in developing new ways of working across the practices in the group in order to reduce duplication, improve healthcare outcomes through greater efficiency and to provide increased resilience. Dr Jacobs has been working with the federated group of practices since she joined Rush Hill Surgery as a partner in 2015. She has seen the passion for a federation grow over the last 3 years and was pleased to join the board as a clinical director shortly after its formation in 2018. She has been a GP since 2004 and moved to Bath in 2007. She is looking forward to working with her dynamic team to develop high quality services for the local community.